This Sunday is the 18th Sunday in Ordinary Time. The readings can be found here. The Gospel is the famous story of Jesus multiplying the loaves and fish. The First Reading is a beautiful statement from Isaiah on material food and the Second Reading reflects on the fullness that comes from unity with Christ. These themes not only speak to the material sustenance but the spiritual, emotional and psychological hunger that all humans have. The recent events in the Gaza-Israeli conflict stir our hearts. Regardless of political leanings or our need to blame the ones who caused the conflict, we hope our hearts are moved by the death by innocent children who are clearly the victims. We pray for the ‘understanding heart’ that Solomon asked to receive from God in last week’s scriptures and our heart becomes formed by the style of teaching to which we are attracted. This week’s scriptures point highlights the style of Jesus that stands in opposition to the world’s styles. I think of a conversation with a friend earlier this week on the Gaza conflict. He is certainly an educated man, but if left me wondering if we could be mis-educated. He spoke authoritatively and decisively on the topic, placed the blame for the conflict squarely upon the U.N. and Hamas, and denounced the character of the Gazans as a people whose value in the world was negligible. I am not remarking on his conclusions (though I disagree with him), but focusing upon his style. My friend spoke and therefore there was nothing more to say. In his thinking, he is right; all other thoughts are wrong. No middle ground is necessary. He denounces the progressive network news, narcissistic academics, and those bleeding hearts that have experience of living in the Middle East. He holds the truth; everyone else is misinformed. If he speaks louder, firmer, and with more force, he silences the other voices therefore assuring his is the only voice heard. He makes himself feel good about his role in the society as he builds walls around himself. Listen to what happens in Scripture, for this is the God’s way forward. 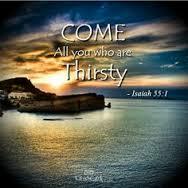 “Come,” all you who are thirsty, you who have no money, drink and eat. Just come. God’s gives us open invitations to freely accept what God intends for us. There are no commands, no force, no bullying, just simple invitations. Listen (in other words, do not speak) and hear, that you may have life. Imitate the Lord who is gracious, merciful, slow to anger, and of great kindness because the Lord has compassion to all. Know that the Lord is close; you need not fear. Even when Jesus is at his wit’s end, he reaches out and cares for individuals because he has an understanding heart that is filled with compassion. Above all, Jesus needs time away so he can grieve the death of his friend, John the Baptist. (Today, he is grieving for all the dead in the conflicts in Gaza, Iraq, Syria, and Ukraine.) The crowds keep coming to him for healing and his heart is always being moved, being informed, by the suffering around him, and he responds with great compassion. He reaches back for them and feeds them by further educating them about God’s care (and God’s style.) It is an always-giving heart. Jesus blessed the activities of his disciples and offered them to God on behalf of the needy people. Notice they did not try to conserve what they had, they gave away what little they had; they looked upon the vast crowds and let their hearts be moved. Jesus may have had to nudge them a little bit, but it was because his ‘understanding heart’ knew that Scripture was being fulfilled, that the Good Shepherd has invited everyone to the table – without regard for nationality, blame, character. All are welcome to the table and all will be welcomed and fed by God. We simply have to lead people to the table, not shun them from it. We cannot let ourselves be obstacles to another person’s salvation because in the end, no created thing will ever keep us from the love of God in Christ Jesus our Lord. Is your heart moved by the tragedy in Gaza, Ukraine, or Syria? Our actions may not have great effect on the national or international scene, but it has many repercussions at the local level. Help the person, whether a bully or victim, admire the style of Jesus through you. Model your style after the ways of God because your small, gentle actions may be just enough to transform the heart of one who can influence larger decisions. That grace may be just enough. Our task is to lead people to the table of the Lord, who will take care of the rest. We are free because we know that not everything depends upon us, but we have to be responsible enough to do our part. Come. Invite. Receive new life. Bring someone who needs life to come to the table. Eat, drink, and be satisfied. This entry was posted in Ignatian Spirituality, Sunday Reflections and tagged 18th Sunday in Ordinary Time, 18th Sunday of Ordinary Time, Catholic, Catholic Reflection, Christian, Eighteen Sunday of Ordinary Time, Eighteenth Sunday in Ordinary Time, Fr. Robert Barron, Gospel of Matthew, Ignatian, Isaiah, James Predmore, James Predmore SJ, Jesuit, Living Space, Middle East, nourishment, peace, Prophet Isaiah, Robert Barron, Sacred Space, Sunday Readings, Sunday Reflection. Bookmark the permalink. The cries of the suffering must inundate the heavens. God asks us to be present to those who suffer. It is not our responsibility to judge but to be present to all. Thank you for sharing this.